Before I go straight into the subject matter I would like to elaborate what this thesis sets out to do. 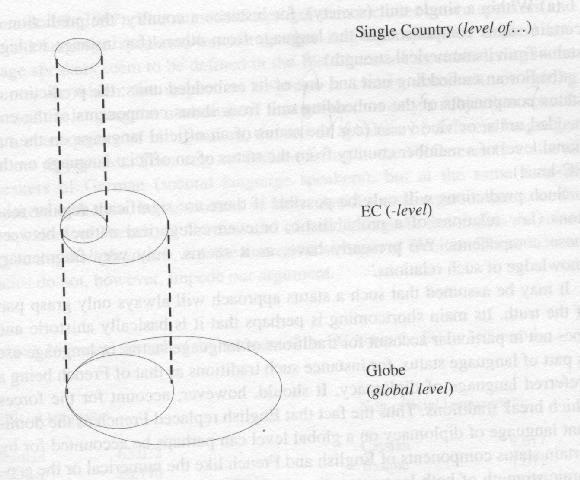 Following the model suggested by Ammon (1991) I am going to look at the spread of English from three perspectives, namely from a global, a European and an Austrian one. In part one (the global perspective) I am going to explore a variety of issues connected with the spread of English. In the second part of the thesis the spread of English in Europe will be analysed. The findings from these two levels will then influence my discussion of the global spread of English in Austria and will be incorporated in a questioner to test their validity in a local context. I will also take a look at the historical dimension to find out if the Austro-German view of the spread of English has changed in the course of time. For this purpose I will analyse schoolbooks from different periods. Ammon, Ulrich "The status of German and other languages in the European Community." In: Coulmas, Florian (ed.) (1991) A Language Policy for the European Community: Prospects and Quandaries. Berlin a.o. : De Gruyter. 241-254.